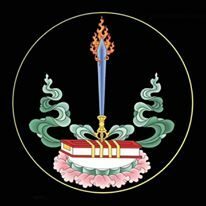 Which, internally, is the city of the Citta (Heart-Mind) of the Vajra Body (vajrakāya). The dynamic energy of whose awakened compassion manifests as an illusory display of form. The eminent personage of Gem the Great Lion [Gésar], with legions of attendants. Resound, like thunder, the heroic warcry of KI KI! SO SO! And wave thy famed flag of virtuous signs in the sky. The massing clouds of blessings bring down flowing streams of spiritual attainments (siddhis). Accept the offering of the deep wisdom of all-embracing equality. Consider me with awakened compassion, O precious Great Lion. Waver not from thy vows, O awakened emanation form of the Three Families. Grant protection and blessing, while accomplishing awakened activity. The fears of the Four Māras, in their entirety, do you dispel. And transfer great blessings to the center of this fortunate one’s heart. And ensure that whatever is done transforms into the path of Awakening. Which turn the inclinations and interests of living beings toward the Dharma. Open the gate to the begemmed treasure-mine of memory, confidence and intellect. Ensure the accomplishment of the Two Benefits, in accordance with my wishes. Swiftly attain complete liberation, becoming the Master of Victorious Ones. I make supplications; I make offerings: Ensure the spontaneous accomplishment of my aspirations and goals. And so it was that on the 6th day of the 7th month of the Iron Dragon Year , Mipham wrote whatever arose [to mind]. Virtue! This text is available for viewing on the website of Erick Tsiknopoulos and the Sugatagarbha Translation Group: http://www.tibetan-translations.com. The Iron Dragon Year : Mipham Rinpoche thus would have been about age 34 when he wrote this.